Meetings with Remarkable Manuscripts is a remarkable examination of twelve illuminated manuscripts from the medieval period. 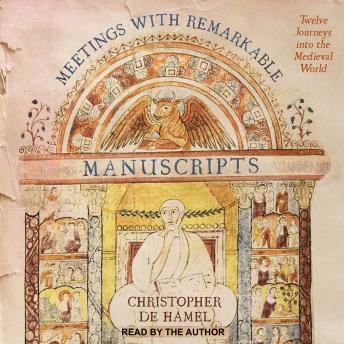 Noted authority Christopher de Hamel invites the listener into intimate conversations with these texts to explore what they tell us about nearly a thousand years of medieval history-and sometimes about the modern world too. In so doing, de Hamel introduces us to kings, queens, saints, scribes, artists, librarians, thieves, dealers, and collectors. He traces the elaborate journeys which these exceptionally precious artifacts have made through time, shows us how they have been copied, who has owned them or lusted after them (and how we can tell), how they have been embroiled in politics, how they have been regarded as objects of supreme beauty and as symbols of national identity.